Much of our work with government partners to deliver better digital services has resulted in full websites, applications, and embarking on large-scale transformation efforts. In addition to those types of projects, we also work on shorter, faster, smaller-scale projects designed to show our partners different points of view and different techniques to approach their most challenging problems. Recently, we partnered with the Office of Integrated Technology Services (ITS) here within the General Services Administration (GSA) on a four-month effort to develop a plain language guide, informed by research and interviews, to help technology companies interested in doing business with the federal government better understand how to join IT Schedule 70. This effort is part of a series of projects GSA has undertaken under a broader initiative called Making It Easier (MIE for short). The goal of MIE is to enable new and innovative companies to do business with the government and supply small businesses with the tools and support they need to do work with the government. Part of the MIE strategy is to make working with GSA as flexible and easy as possible by simplifying and streamlining processes. IT Schedule 70 is the largest multi-agency government contract vehicle to purchase technology products and services. Private vendors apply to GSA to be added to IT Schedule 70, then federal agencies use that list of vendors to fulfill their technology products and services needs. It’s a unique type of contract, in that other federal, state, and local government agencies can order from it using a streamlined process that typically takes far less time and effort than the award of a standard, “bespoke,” contract between an agency and company. As we heard during interviews with vendors, it can be challenging to understand whether IT Schedule 70 is the right program for them. Further, after a vendor knows that they do want to be part this particular schedule program, it can be hard to figure out how to apply. 18F experienced these challenges firsthand as we embarked on the creation of the Agile BPA last year. The Agile BPA is a type of contract 18F is now using to deliver great digital services to our partner agencies, and it’s based on IT Schedule 70. When we first announced this effort, we heard from a lot of vendors who were interested in being a part of it, but found the process of getting on IT Schedule 70 daunting. Both the vendors who go through the process to join IT Schedule 70 and the GSA contracting officers who work with them acknowledge that the process can feel muddied and difficult to navigate. Both parties also acknowledge that the process can take a relatively long time to complete — sometimes the better part of a year, particularly for vendors who are newer to the federal acquisition process. 18F and ITS share a desire to make the user experience for vendors applying to IT Schedule 70 smoother and more successful. The combination of ITS’ contracting expertise and 18F’s user-centered approach were key as we began to build on research from the Federal Acquisition Service and the Office of Customer Experience (both offices inside GSA) as we learned what and how to communicate with vendors who might be qualified candidates for the IT Schedule 70 program. We talked with vendors about their experiences with the IT Schedule 70 process, what they had the most trouble with, and what information needed to be clarified. We also talked with contracting officers to see where they saw the most mistakes being made as they reviewed the offers submitted by vendors. 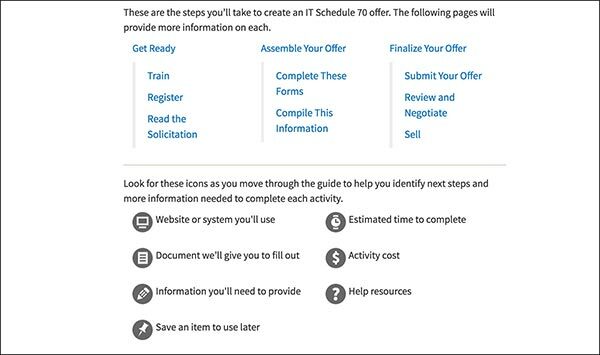 In the end, we took all of the information we gathered and combined it with the results of a content audit and brainstorming sessions to write a step by step guide to what people need to know when submitting an offer for an IT Schedule 70 contract. This project might seem out of the norm for 18F. Maybe it doesn’t seem high-tech enough to fit in with the kind of work we do — it’s all words and very little code! But at 18F we do much more than just improving tech products. We’re also here to change culture and improve the user experience all around, and that includes improving content. For this project, we focused on rewriting and reorganizing content and using visual design techniques to ease the burden of reading this text-heavy guide. Good content design doesn’t only involve words, it also involves visual elements to help get a story or a message across, and they’re both essential to a good user experience. Like our more coding-heavy projects, we followed user-centered principles, including interviews, sketching prototypes, and user feedback, from start to finish. Finally, as we mentioned, the development of this guide is one of a number of projects currently underway at GSA to make things easier for those interested in doing business with the federal government. Other projects include the IT Schedule 70 Startup Springboard, which will help new vendors with innovative products qualify to get a contract sooner than they might otherwise be able to. There is also the Welcome Package intended to help vendors with a newly awarded contract be successful and maintain their award into the future. One more effort worth noting comes out of the Presidential Innovation Fellows program. It’s a new product called apps.gov. It will help government agencies explore and learn about cloud software that they can purchase, including many options available through IT Schedule 70. Technology vendors can also submit their software products to be listed on apps.gov and learn about the various government approvals and opportunities to sell across the federal government. It’s still an evolving tool, but the goal is to eventually get to a fully transactional marketplace between the private and public sectors.